In an first-of-its-kind victory, a team of biologists has figured out how to clear ponds of the lethal chytrid fungus that’s decimating amphibian populations worldwide. (Spoiler: It’s pretty damn intense). 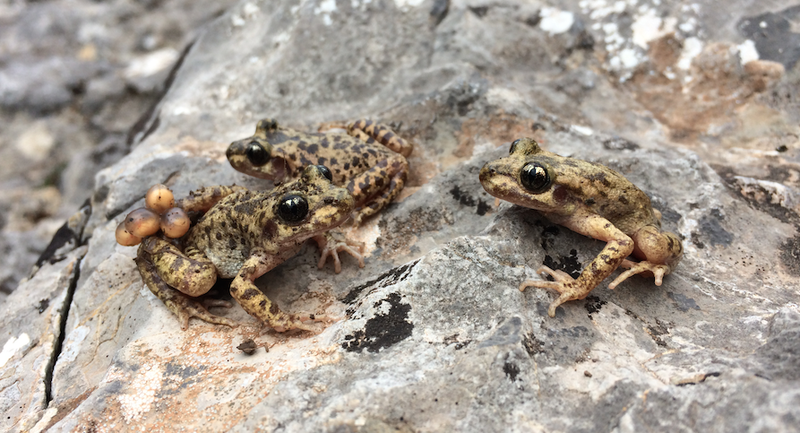 As reported this week in Biology Letters, biologists from the Zoological Society of London (ZSL) and elsewhere have eliminated the deadly fungus from four out of five mountain ponds located on the Spanish island of Mallorca. The ponds are home to the rare Mallorca midwife toad (Alytes muletensis), which, for the first time in years, seems like it may have a future. “This study represents a major breakthrough in the fight against this highly-destructive pathogen; for the first time we have managed to rid wild individuals of infection for a continued period,” biologist Trenton Garner of the ZSL said in a statement. The effort to eliminate the chytrid pathogen Batrachochytrium dendrobatidis (Bd)—which eats its way into the host frog’s skin, causing it to harden into a fingernail-like substance—began in 2008. For several years, scientists hiked out into the remote wilderness to capture and treat Mallorcan midwife tadpoles with anti-fungal drugs. It didn’t work. Neither did draining ponds, letting the ground bake in the summer sun, and reintroducing tadpoles in the rainy season. And so, a few years back, the biologists declared war. First removing all the tadpoles they could find, the team drained five ponds and blasted the muddy ground with Virkon S, a laboratory disinfectant that kills, well, just about everything. The sequestered tadpoles were treated with anti-fungal drugs and reintroduced once the ponds had been replenished with clean water. After months, the researchers returned the cured toad population. For more than two years now, four of the five ponds have had no infected tadpoles. The fifth pond is getting a second treatment. Obviously, this is an extremely invasive procedure that’s not going to work everywhere. But it’s heartening to see any signs of progress in the fight against this awful disease. Spread across the world by traveling men and women, Bd has precipitated the catastrophic die-off or extinction of at least 200 species of frogs on five continents. Thanks to air travel, amphibians are now a poster child for the sixth mass extinction. As they say, desperate times calls for desperate measures.